· Epoxy resin is approximately 20 times more corrosion resistant than nickel. In the automobile industry, it is a technology which has gradually replaced nickel and chrome allowing car manufacturers to grant a 6 year, or even 12 year, guarantee on the bodies. · The qualities of epoxy resin ensure for a better coating in concealed or inner areas. I.e. the “Faraday effect” is minimised compared to nickel or chrome plating. · The spreading of rust is much quicker below nickel plated surfaces than epoxy painted surfaces. · An epoxy painted finish provides greater electrical insulation than nickel or chrome plating allowing greater resistance to welding pellets. · A colour painted finish is more visible in the work place. This reduces the incidence of loss and can reduce the risk of injury. 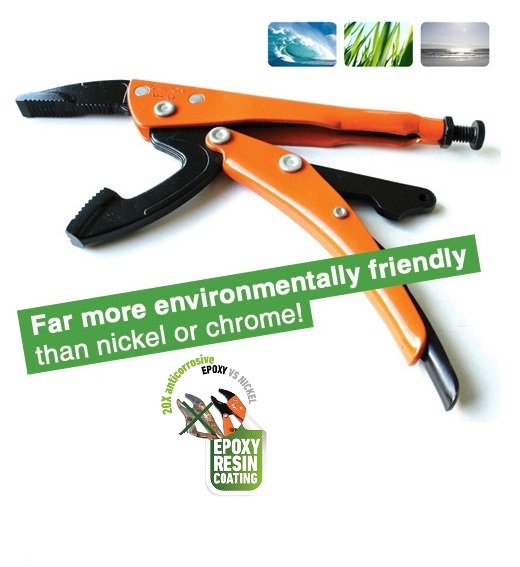 · Using epoxy resin in the manufacture of our locking tools is far more environmentally friendly than nickel or chrome. This is in line with the prestigious ISO 14000 which instigates, among other things, the use of non-polluting agents. · Using epoxy paint helps distinguish the tools on the market place and allows for a customized finish by using corporate colours. · Painted hand tools are becoming more common. As a supplier of painted locking tools, we ourselves are witnessing increased demand for this option.